I can always tell the end of a holiday is nigh when the drama comes back. Lots of emails, phonecalls, scheduling, diary filling up. Playing for a wedding on Saturday. Meant to be teaching on Thursday but due to unforeseen family circumstances I’ve had to cancel. Due to start my other teaching job next week too. I’ve had a singer on to me about doing a gig in Donegal but can’t get in contact with her. Had someone else get in touch with me about a gig in Sligo in December because someone panicked and pulled out. So I had a hectic morning of pencilling things in, rubbing things out, moving things about and doing the hokey pokey. 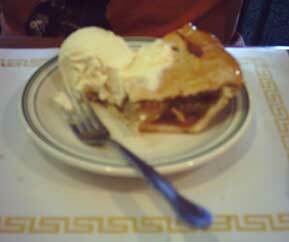 What better antidote to end-of-holiday packing fatigue than a slap up meal down at the diner! I’ll never eat in Eddie Rockets again. We took it easy last weekend. Saturday, we slept in and went to the mall. I scored a swanky Ann Taylour skirt for $20 in a sale. Sunday, we drove down to Jersey shore to cheer my sister on in her first triathlon. She did really well! She did a 750m swim, 20k cycle and 5k run in 1 hour 20 mins. Super, no? She drove back with her fellow triathlon friends and Alb, David (brother in law), Liam (nephew) and I went to fly our pirate ship kite down on the beach. I kid you not. It was yarrrrsome! Yesterday was our last day in Manhattan. We went up to the top of the Rockefeller centre, which is now rival to the Empire State building. It’s not as high but we had a great view of the Empire State from the Rockefeller. I was up the ES about ten years ago and have horrible memories of interminable queues, horrible crowds and barely being able to see over the parapet. Top of the Rock was fantastic: no queue, no crowds, and a see-through parapet. After, we went to B&H way over on 9th avenue. It was worth the walk, though. Seeing is believing! I’ve been in lots of huge stores but this one is different. You can examine and compare every item of stock in person in the shop but when you want to buy something, you go to the desk and tell them what you want. Pretend you want a camera, but just as you’ve told the guy, you realise that you’ll need a memory card, a tripod and a camera bag. You tell him exactly what you want and a green cart descends from the ceiling and whizzes around the shop to the specific areas whereupon a clerk will pop in your card, tripod or bag and send it on to the next area until your order is fulfilled. You, in the meantime, wander on over to the pay area, all the while watching the conveyor belts and green carts zooming along over your head, and by the time you’ve forked over your moolah, it’s in all bag waiting for collection. Did I mention it is dirt cheap too? Afterwards, we hung around Times Square until it got dark, ate burritos, and took photos. I hear it is raining at home. Be still, my beating heart. It seems that Boston is famous for having invented its own type of baked bean, resulting in many a cheesy teatowel, apron, magnet, oven gloves and anything else you can think of with BeanTown emblazoned on it. Sadly, we are no longer in Bean Town. We are in Noo Joysey. I have no pictures of Bean Town to show you because I shot in black and white film and all our colour photos are on Alb’s camera. We did lots of fun things, though, including the unofficial Hahvahd Tour, a Duck Tour (upon which I got to drive the boat, nearly crash into the Charles Bridge, and announce that South Dakota was famous for chickens (I was mixing it up with South Carolina and mixing that up with Kentucky)), and a tour up the Prudential building since the John Hancock has been closed since 9/11. There is a place in Bean Town called Newbury Street and is much like Grafton Street except on a much longer and grander scale. Imagine my surprise when I googled for yarn shops in the area and came up with two on Newbury street! One was awful. The other was lovely and I stayed a long time, squeezing, smelling and chatting. I’m not really on a wool mission this time around so I contented myself with a skein of Cherry Tree Hill sock yarn because I finished my last pair on the flight over. Your eyes do not deceive you! It is another Pomatomus! This guy has been accompanying me around Manhattan for the last two days. We travelled down from Boston last Monday afternoon and planned to head into the city on Tuesday, but it rained all day. We stayed at home, took it easy. In other words, I wound up the sock yarn, printed the pattern, cast on, baked M&M cookies, knit some more and got directions to a yarn store near by. When the rain cleared off, I ventured out and spent a very enjoyable 45 minutes rooting around yarns of every description. I didn’t buy any yarn though. 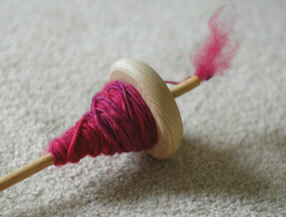 I decided to pick up a spindle instead. I am hooked! I have been doing a little each evening and I have already spun up half of the roving (Fleece Artist merino, blue faced leicester, mmmm). 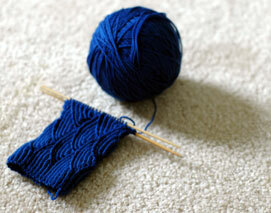 It is the perfect antidote as it is a fibreish activity but not knitting. I just need to wind off this stuff before I can get cracking on the rest and ply the two lots together. Yay!